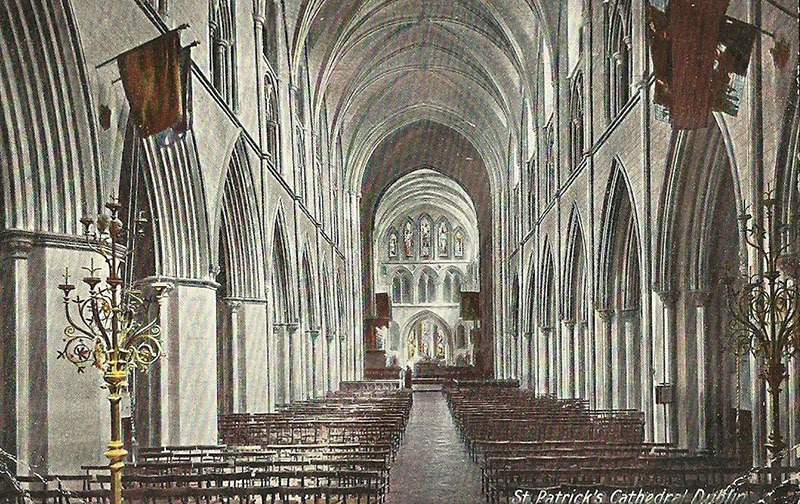 St Patrick’s Cathedral is traditionally the site of a holy well used by St Patrick for baptisms and a church was established here as early as the late fifth century – a stone marking the site of the well was found in 1901 after the demolition of buildings nearby to form the park beside the cathedral. 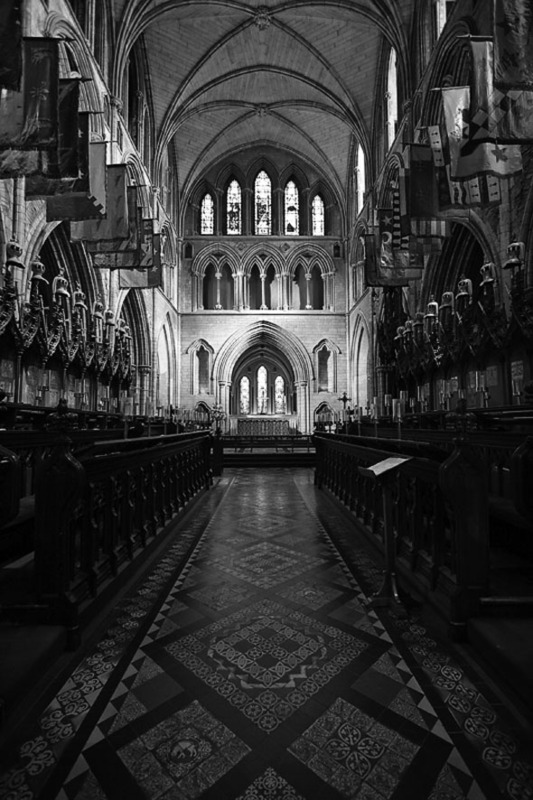 The present cathedral was founded in 1192 by Archbishop John Comyn. 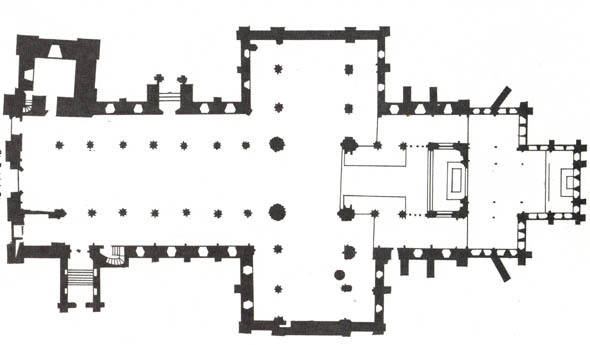 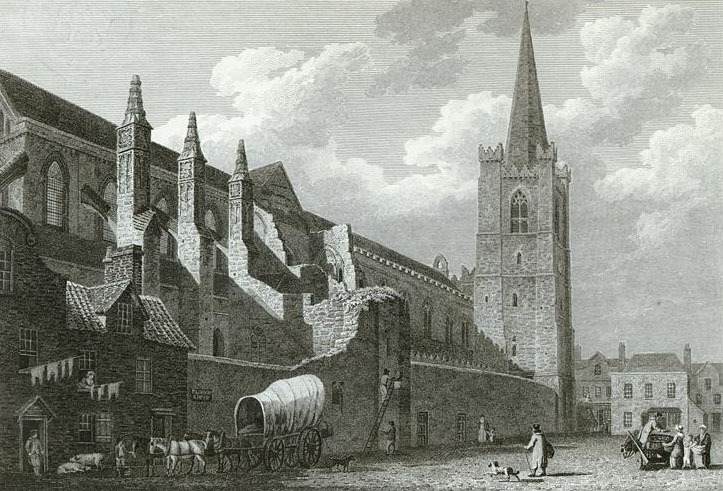 As Archbishop he resided in the priory of Christ Church Cathedral – unwilling to submit to the jurisdiction of the City Provosts, he started a cathedral and palace outside the city walls. 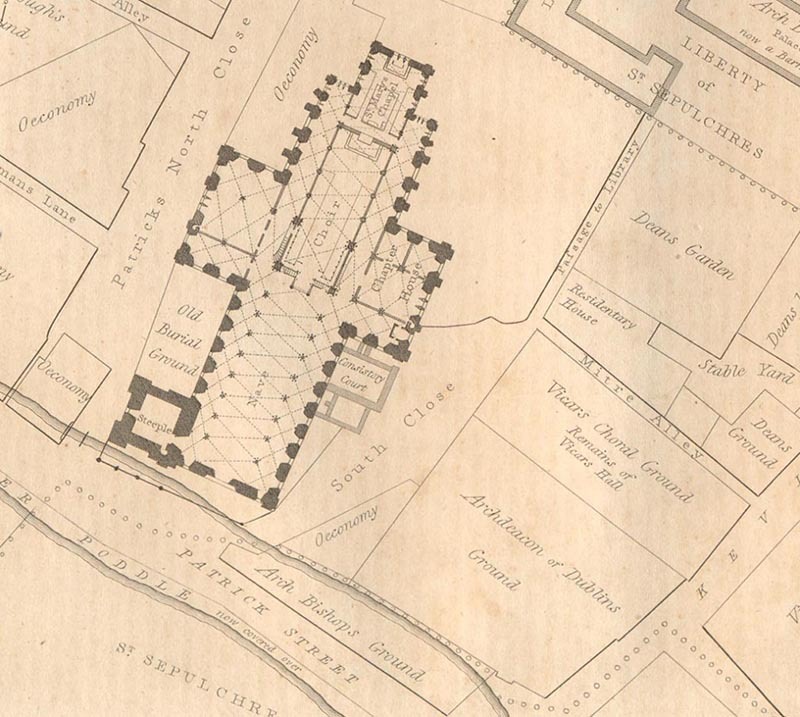 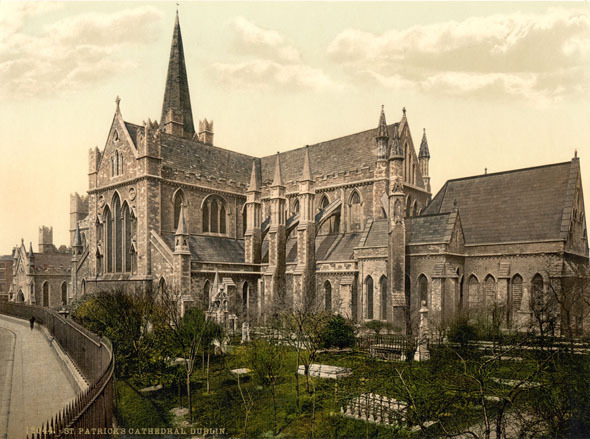 This palace known as St Sepulchre’s remained the seat of the Archbishops of Dublin until 1806. 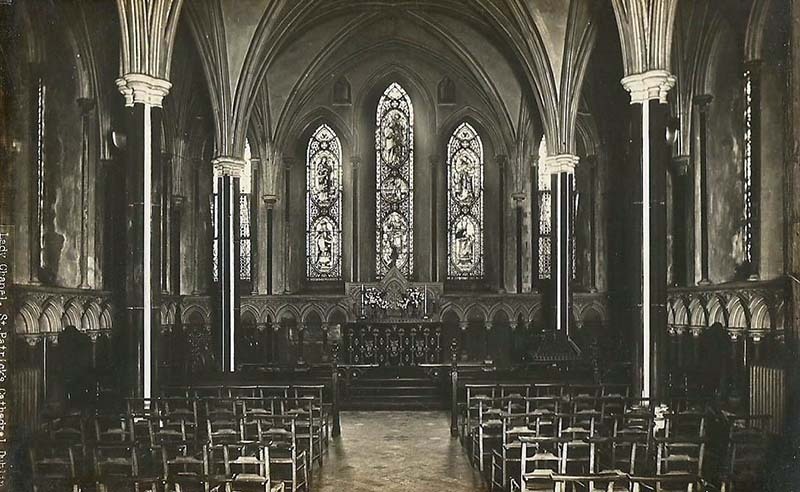 It is now in use as a police station. 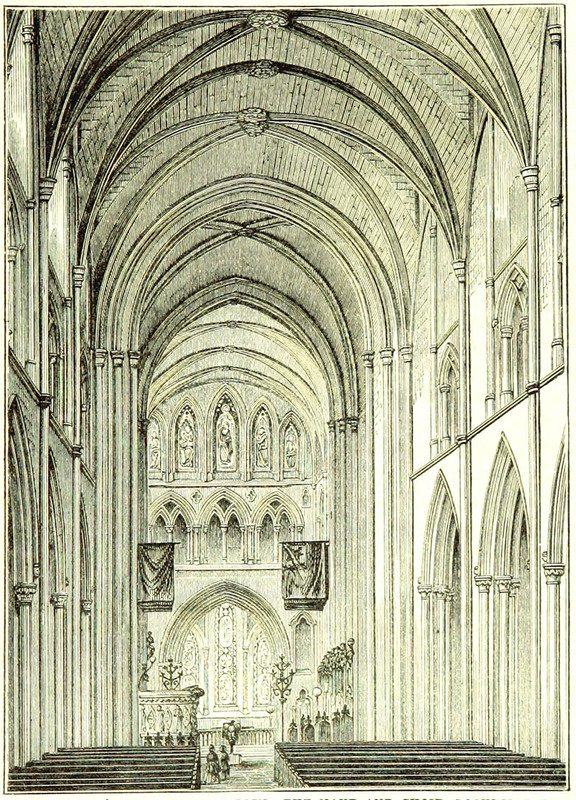 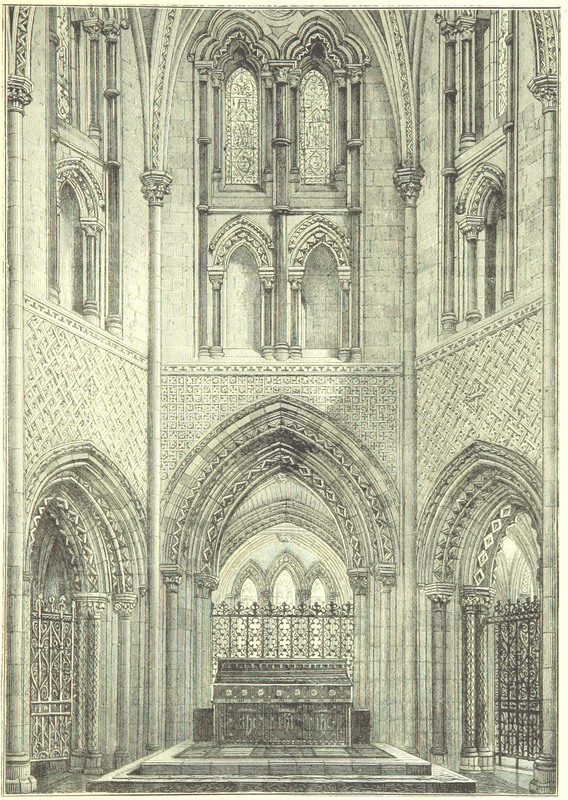 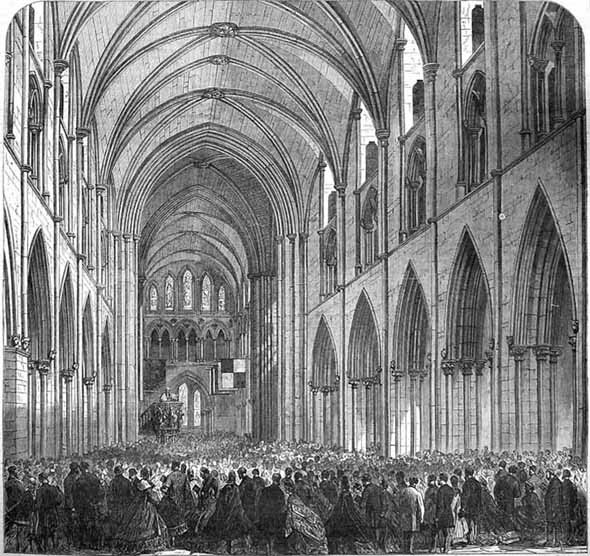 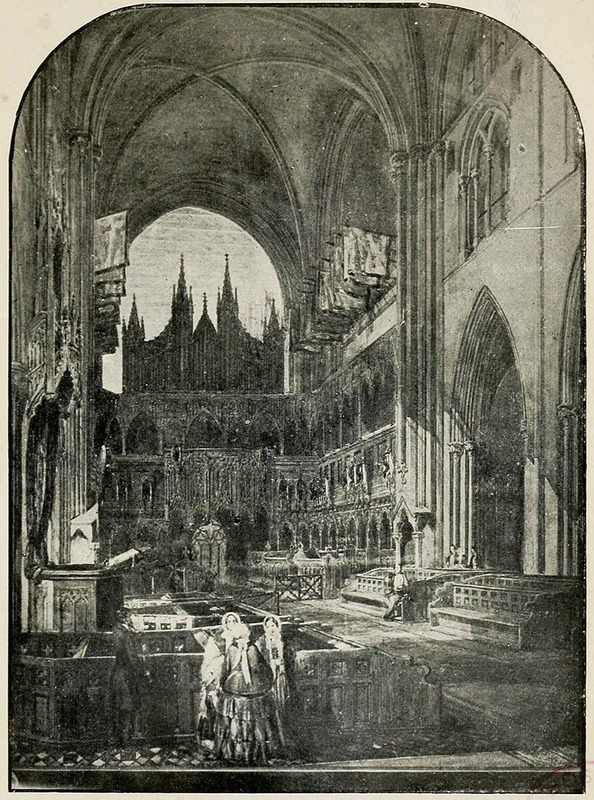 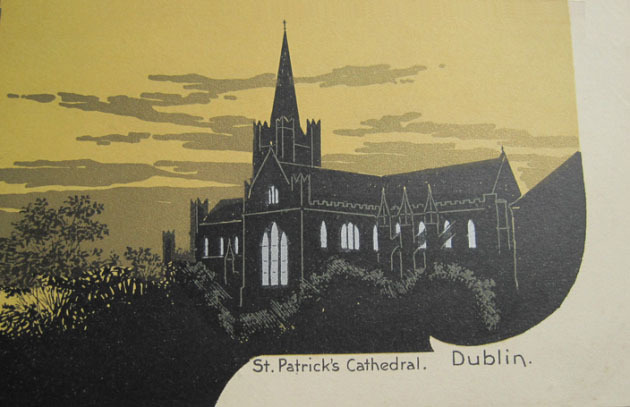 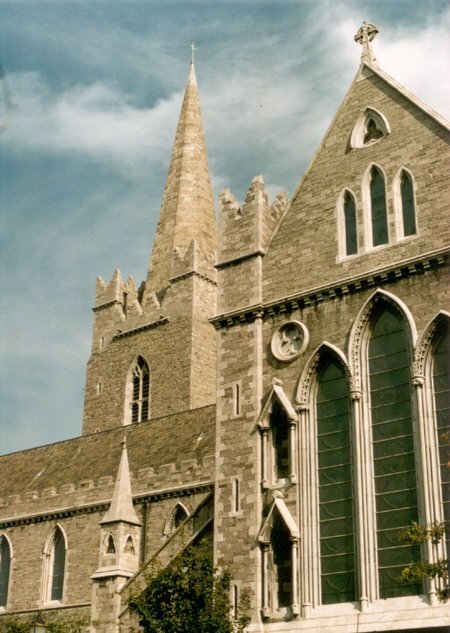 It is probable that Comyn intended to reduce the status of Christ Church Cathedral and its refusal to accept the removal of its privilege produced the anomaly of Dublin having two cathedrals for the one diocese. 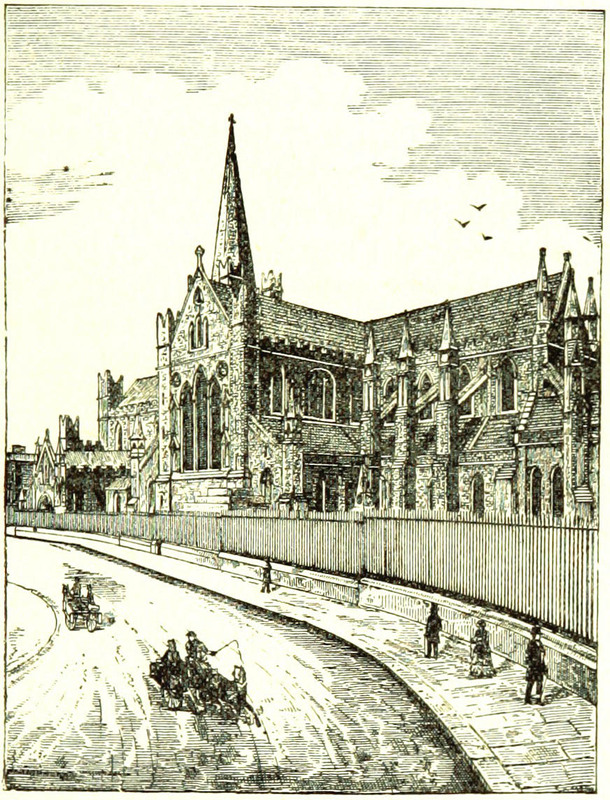 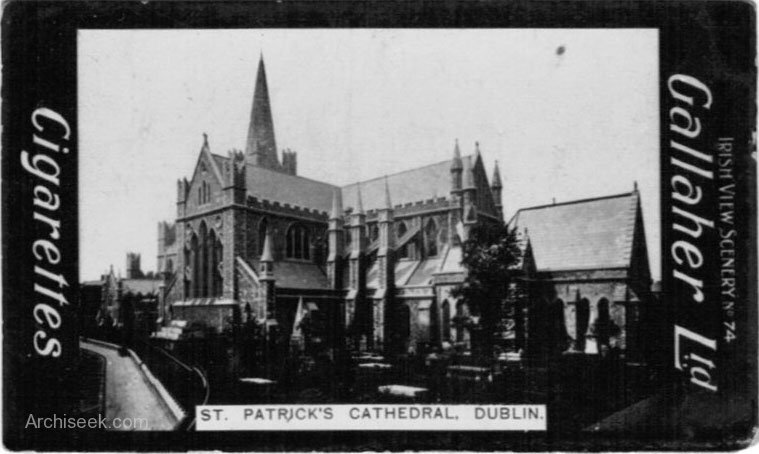 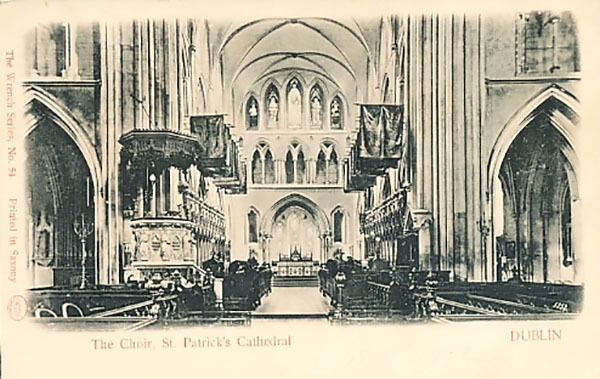 In 1872 as a result of the disestablishment of the church, St Patrick’s became a national cathedral for the Church of Ireland and is used by the state for ecumenical services. 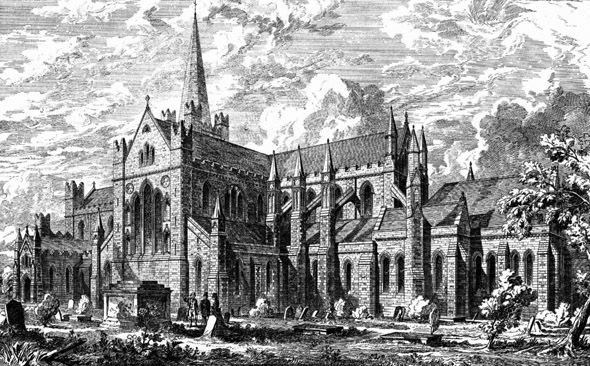 After rebuilding from 1225 onwards, the cathedral was rededicated in 1254. 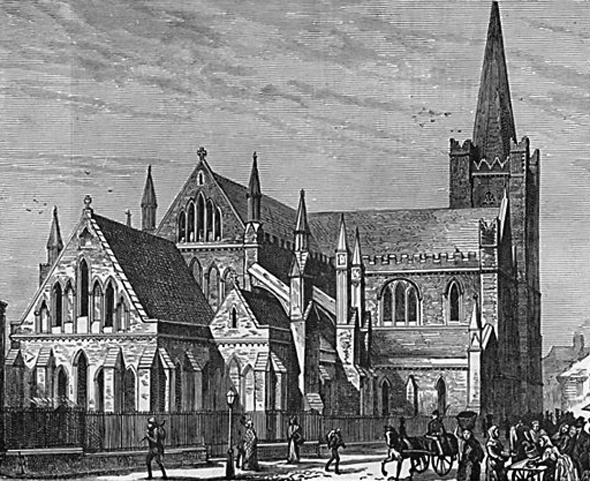 In 1320 a University was founded at St Patrick’s with the approval of Pope Clement V and it continued until the end of the 15th century when lack of funds caused its closure. 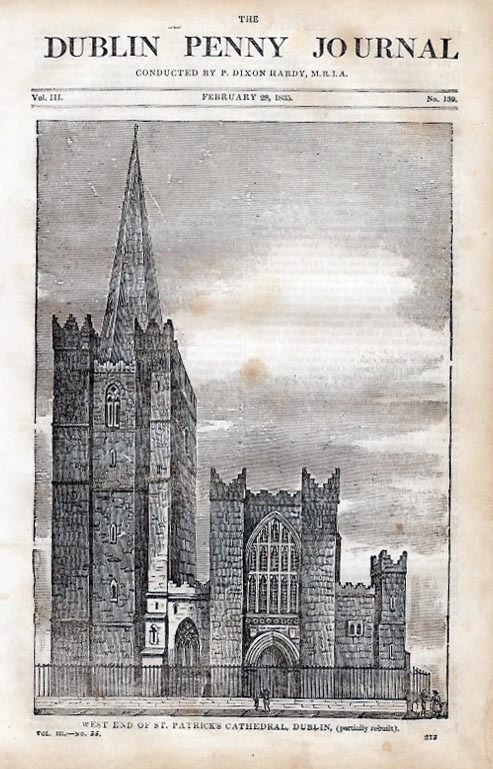 In 1547 Archbishop Browne tried to revive it. 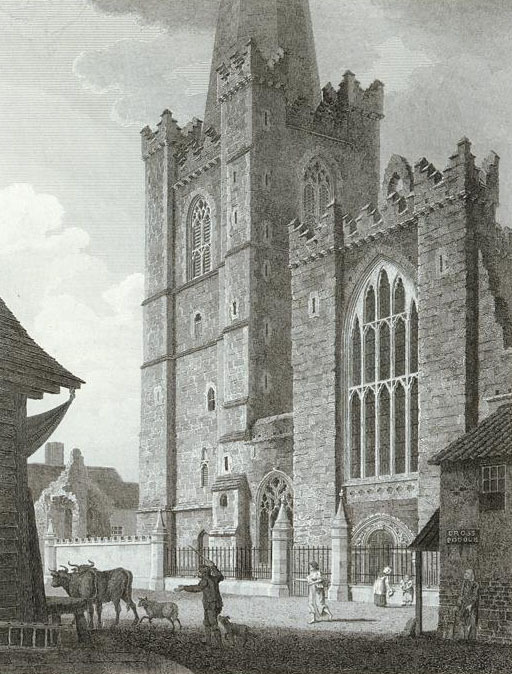 In 1584 Queen Elizabeth I issued an edict ‘to consider how a college might be erected’ – St Patrick’s was considered unsuitable and All Hallow’s priory was chosen for the site of Trinity College. 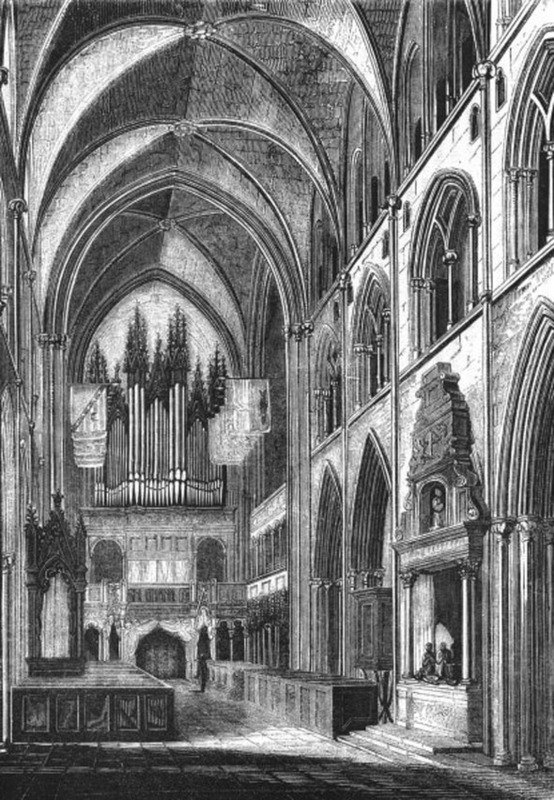 A fire in 1362 destroyed the tower and part of the west nave. 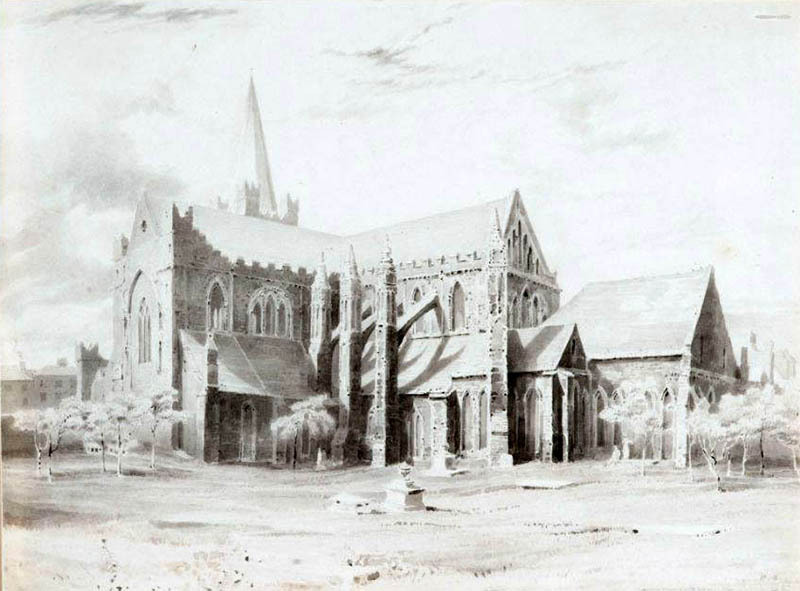 Like Christ Church the cathedral was much neglected over the years and by 1860 was in a poor condition. 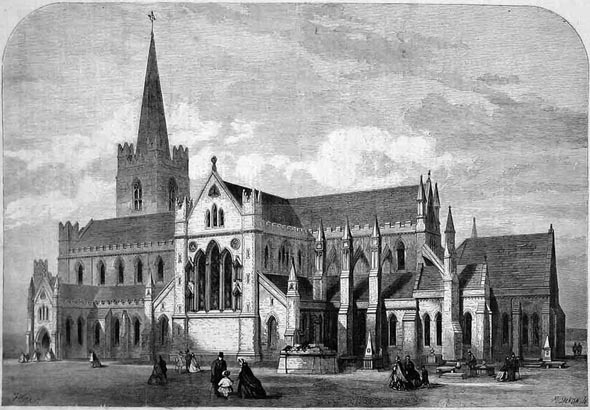 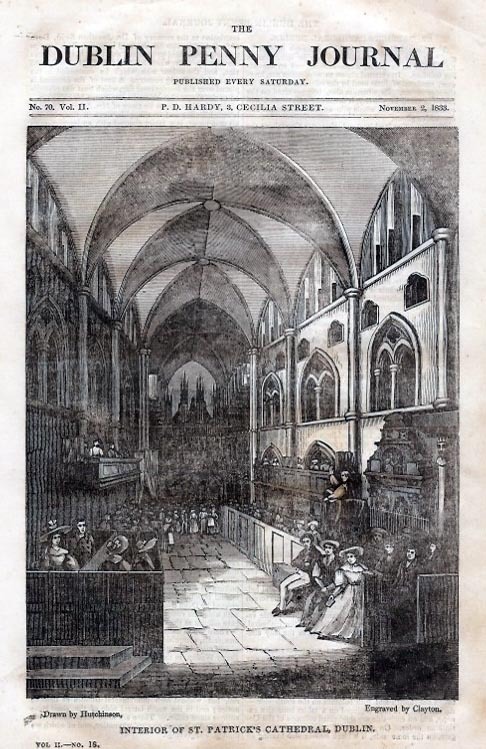 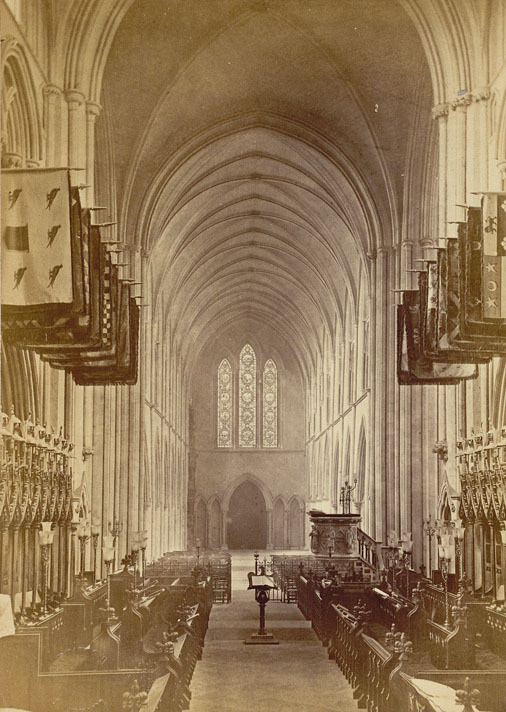 Again like Christ Church, St Patrick’s acquired a wealthy benefactor, Sir Benjamin Guinness who funded the restoration of the building between 1860 and 1860 at a cost of around £160,000. 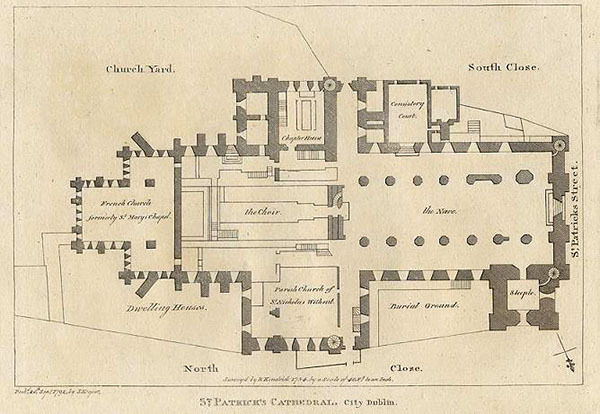 There was much discussion in the pages of The Irish Builder on the “restoration” as they referred to it. 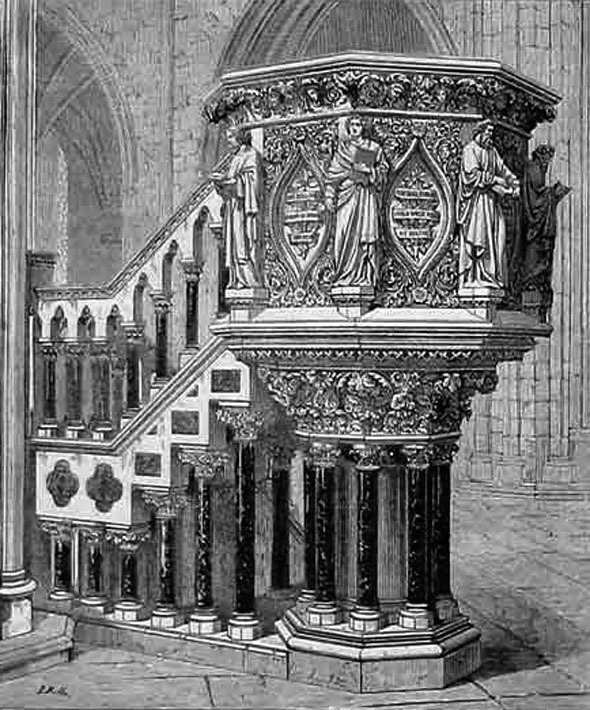 Much of the work was carried out on the instructions of Sir Thomas Drew. 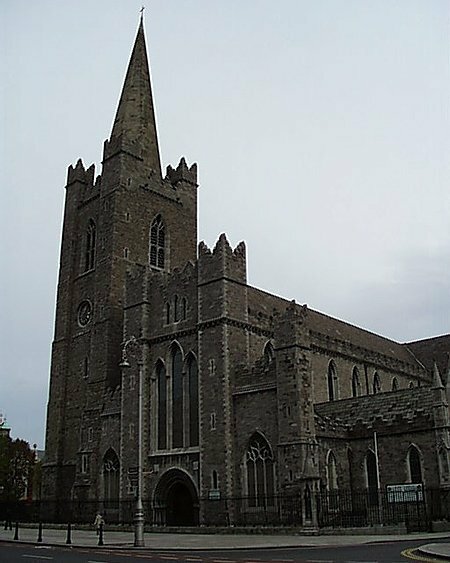 St Patrick’s is one of the largest cathedrals in Ireland, where cathedrals tend to be smaller than those on the continent. 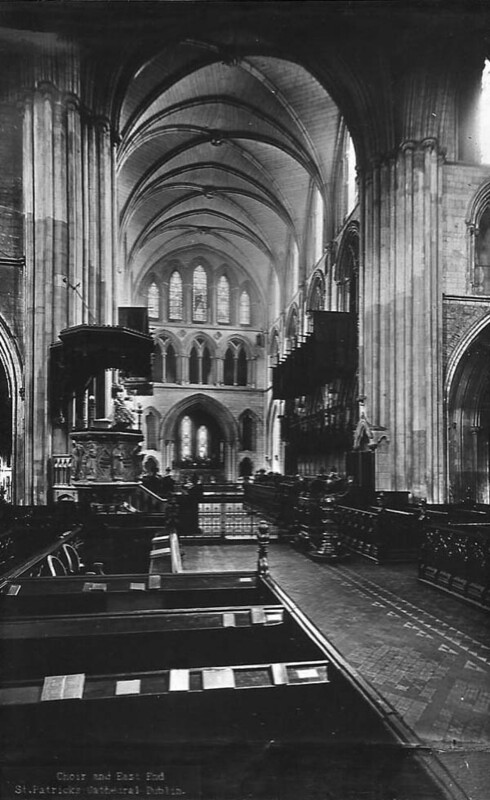 It is 91 metres long externally and the nave is 17 metres high. 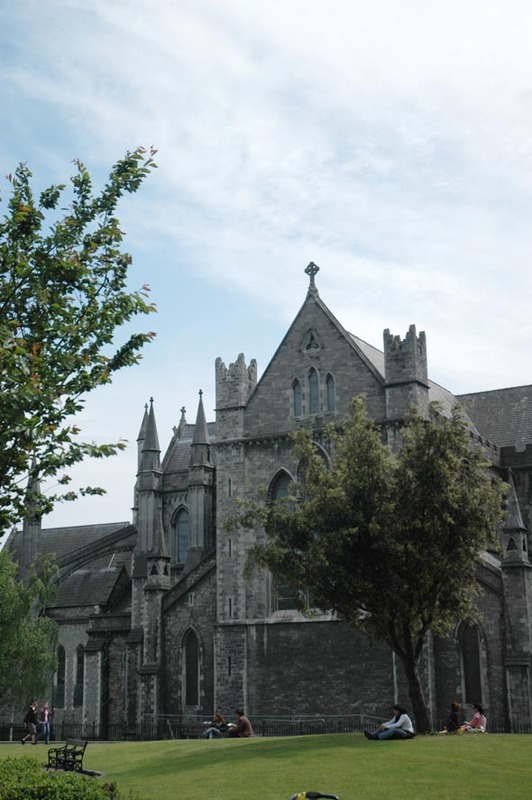 Built in an early English gothic style the cathedral has heavy buttressing and stout walls. 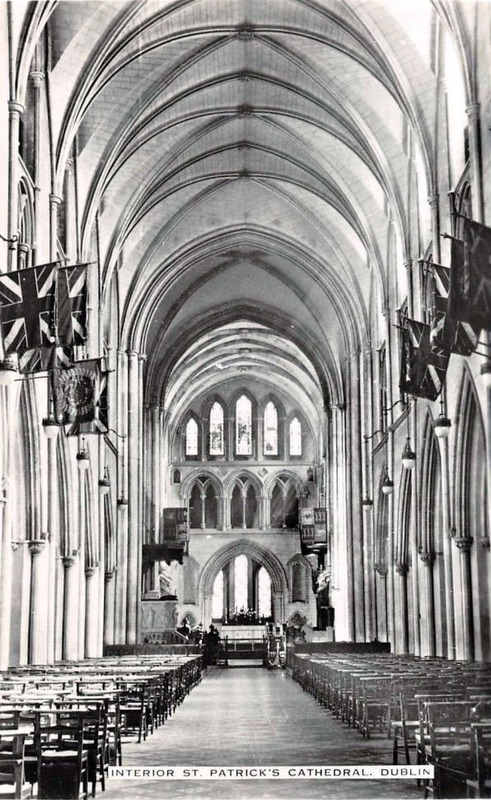 Internally it is decorated with memorials and monuments to important families and individuals connected to the cathedral. 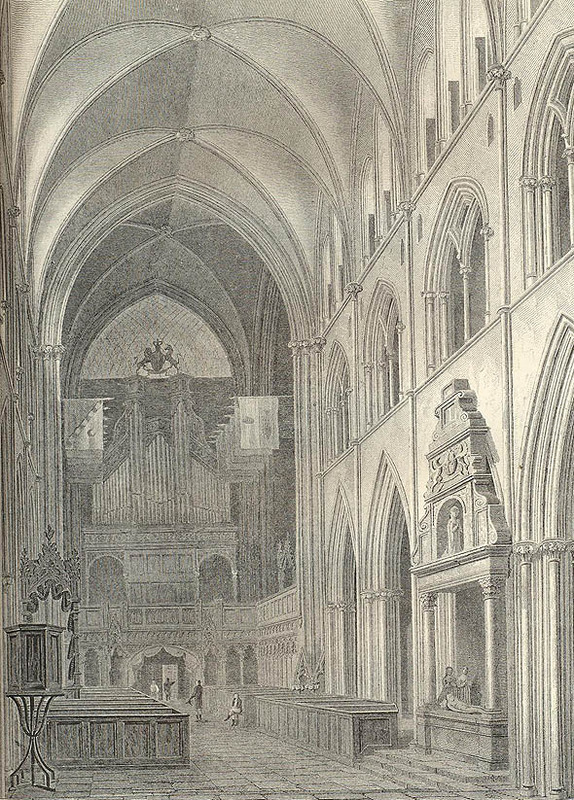 Jonathan Swift, author of Gulliver’s Travels was Dean of the cathedral for many years and his portrait shows St Patrick’s in the background.